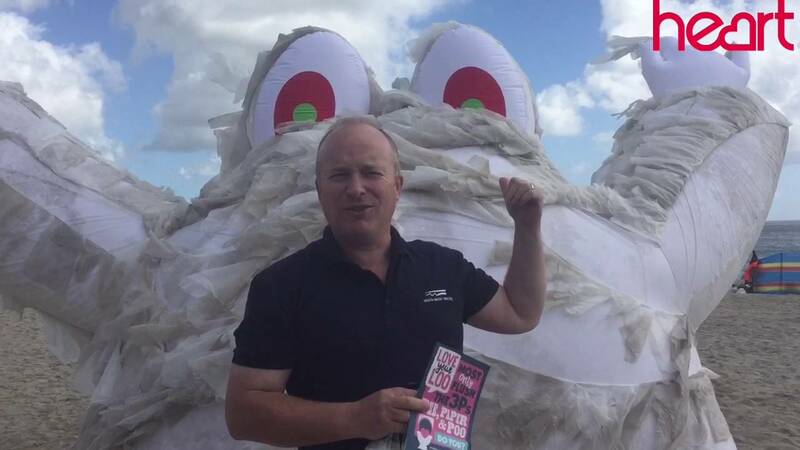 Wallace the Wet Wipe monster has been on Gyllngvase beach to highlight the problems wet wipes cause. The UK's leading marine charity and the water company that supplies Cornwall, are joining forces to highlight the huge problems created by flushing wet wipes down the loo. Wallace, a giant monster made out of wet wipes has taken centre stage on Gyllngvase beach, to help them highlight the issue to the public. The Marine Conservation Society say that the number of wet wipes found on UK beaches have increased by 400% over the last decade and there are now about 50 of them found on every kilometre of coastline cleaned by the charity. South West Water say when they're flushed, they cause blockages because they don't meet the water industry standard allowing them to biodegrade. South West Water says it costs them, and their customers, £4.5million each year to clear around 8,500 blockages in their sewerage network. Last August, South West Water launched its Love Your Loo campaign to encourage customers only to flush the 3Ps - pee, paper and poo. One of the problems lie with the manufacturers, and both the Marine Conservation Society and South West Water say misleading labelling must be wiped out.